Hello, Friends and Happy Monday! Welcome to Mix it Up Monday! I’m so excited you are here and can’t wait to share how I mixed up floral image stamps and dies to create these Clean & Simple Valentine’s Cards. While the end result of CAS style cards looks simple, it sometimes takes me f-o-r-e-v-e-r to create and these two cards fall right in that category but I always love the end result! Both of these cards used the same design process but resulted in two unique card designs. Die cut the EBE Folk Heart on a white card panel. Stamp and die cut floral Images from Hello Sweet Friend & Hopeful Flowers. Add light coloring to the floral boughs. Arrange and adhere the floral die cuts to the rustic heart cut. I used a combination of Nuvo Adhesive & Foam squares to adhere the florals. Blend some yummy pink inks with a Blendability Brush to a Bristol White card panel that is smaller than the heart die cut panel. After blending, adhere the two panels together. Stamp and die cut the Love sentiment from Let Love Grow. For extra dimension, cut little pieces from your small foam squares and adhered to the back of the die cut and placed the “love” in the center of the hearts. For extra dimension, add some sweet little embellishments to the card. I also added some Nuvo Drops around the heart without the blending so it didn’t get lost against the white background. Add your favorite black and white washi to the right-side of the card base or card panel and adhere your heart card panel over the washi and to a pink card base. So there we go friends, two Mix and Match designs for Valentine’s Day. I hope you enjoyed these projects and can’t wait to see you next week! For more inspiration all week long, check out/subscribe/follow the Trinity Stamps Blog, You Tube and Instagram. 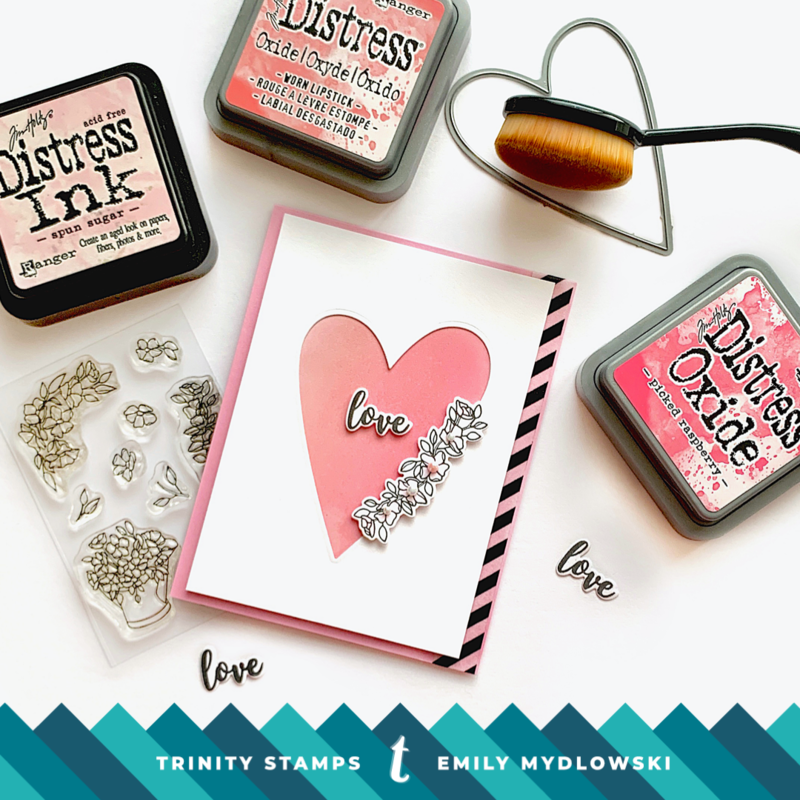 We love to see your Trinity Stamps designs so don’t forget to post your Trinity Stamps creations on Instagram and tag #trinitystamps!